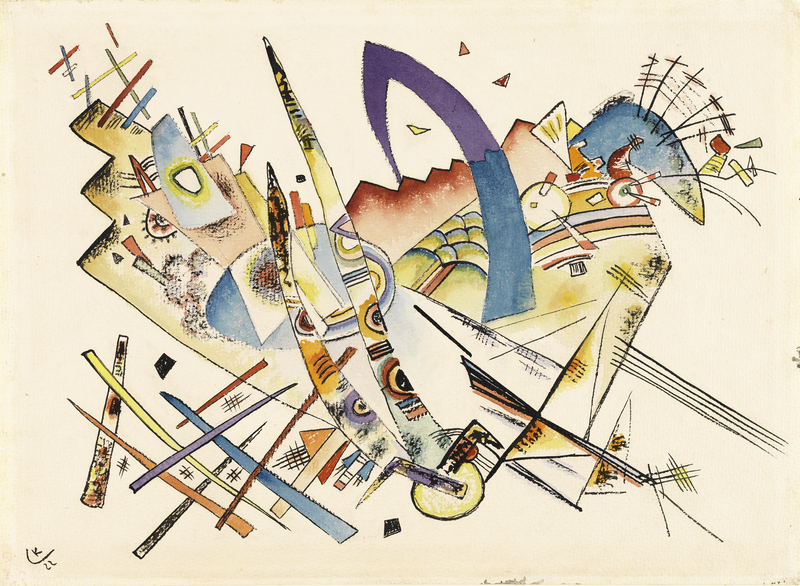 The present watercolour by Kandinsky, dated 1922, is not clearly specified in the handwritten list the artist compiled of his works, but as Vivian E. Barnett states, it was identified by Nina Kandinsky as number 27 on the aforementioned list on the occasion of the exhibition of his work at the Moderne Galerie Otto Stangl in Munich. The precise style of the painting, which combines freely composed, purely abstract forms and geometric elements such as triangles, circles and straight lines, is fully consonant with Kandinsky’s early period at the Weimar Bauhaus, where he began to teach in mid-1922. Distinguishable on the right among the few recognisable elements of the composition is a highly schematised boat with a triangular sail, which was featured in his early works as a symbol of the Flood. The semi-curved and straight lines, intertwined like swords, bear a resemblance to the forms that make their appearance in the oil painting in the Thyssen-Bornemisza collection entitled In the Bright Oval, painted three years later.